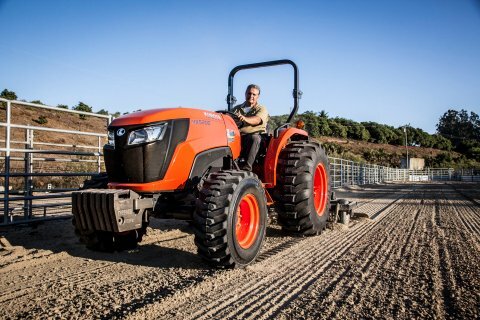 Kubota Tractor Corporation introduces two new models to its MX-Series utility ag tractor line with the MX4800 and MX5200; both offer two- and four-wheel-drive models and HST models, and deliver 49.3 or 54.7 horsepower, respectively. With enhanced environmental performance, compliant with Tier 4 Final emissions, as well as increased engine power, greater comfort and upgraded ergonomics, the new MX-Series maintains many of the powerful and versatile features inherited from previous MX-Series models. The Kubota diesel engine in the new MX4800 and MX5200 models provides a smooth transfer of power, low noise and quick starts. A Common Rail System (CRS) and Diesel Particulate Filter (DPF) offer cleaner emissions that comply with EPA Tier 4 Final emission regulations, and electronic common rail direct fuel injection maximizes fuel economy. Each model features hydraulic servo HST systems that increase pedal responsiveness and shifting ease regardless of load size. And, Kubota’s synchro shuttle transmissions on the gear drive models – with 8 forward and 8 reverse speeds – maximize productivity with easy shuttle lever shifting for maximum control. Easy handling and maneuverability make traveling from site to site easier. Both the two- and four-wheel-drive models come equipped with easy-turn hydrostatic power steering, and a touch and turn, electric PTO switch has been repositioned to the right side of the console for convenient operation with a push and turn start. The new suspension seat on the MX4800 and MX5200 provides greater comfort for reduced fatigue after a long day’s work. The fully flat deck enables safe and easy mounting and dismounting, with 30 inches of space between fenders, giving the operator more room to work in comfort. In addition, the easy-to-operate hanging pedals optimize leg room. More comfort features include a convenient cup holder, behind-the-seat toolbox, and newly designed LCD dash panel with larger, easy-to-read gauges. The new models also feature a larger fuel tank with 13.5-gallon capacity for longer, more productive operation, with fewer fill ups. The newly designed, one-piece slanted hood increases visibility and is made of steel for added strength. With hydraulic dampers for easier opening, the fully-opening hood allows for quick and efficient routine maintenance checks. Assembled in Georgia, Kubota’s performance-matched LA1065 front loader and BH92 backhoe were designed to ensure precise operation and improved productivity for the MX Series. The high lift capacity and lift height of the LA1065 front loader delivers impressive performance and with each load it has a maximum lift height of 111.2 inches and lift capacity (at pivot pin) of 2,275 pounds. The series valve provides dual function ability for simultaneous operation of the lift and bucket circuit. The regenerative dump circuit provides fast bucket dump times. A two-lever quick coupler is now standard equipment for easy attaching and detaching of implements such as buckets and bale spears. Hydraulic tubes are enclosed within the rounded boom for protection and a clean look. The BH92 backhoe delivers more power and greater capacity with over 9 feet of digging depth. Attaching and detaching is simple and, with the hoses routed through the backhoe arm operation, appearance is cleaner and offers better protection. The fully-flat deck delivers optimal leg room for maximum comfort while the optional hydraulic thumb offers greater versatility for working the backhoe. The powerful Category I and II 3-point hitch easily handles implements, with standard rigid link ends on the MX4800 and MX5200 models. Telescoping link ends and stabilizers are standard on the MX5200 four-wheel-drive models, and optional on other models in the series, making attaching and working with large implements easier. 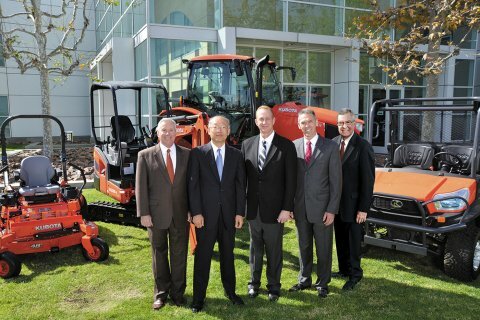 Kubota Tractor Corporation, Torrance, Calif., is the U.S. marketer and distributor of Kubota-engineered and manufactured equipment, including a complete line of tractors up to 118 PTO hp, performance-matched implements, hay tools and spreaders, compact and utility-class construction equipment, consumer lawn and garden equipment, commercial turf products and utility vehicles. For product literature or dealer locations, contact Kubota Tractor Corporation at 3401 Del Amo Blvd., Torrance, CA 90503, (888) 4-KUBOTA [(888) 458-2682], Ext. 900, or visit www.kubota.com. Kubota introduces the all new MX4800 and MX5200 to its MX-Series diesel utility tractor line. Each model offers a choice of two- and four-wheel-drive gear transmission models, and an HST four-wheel-drive model, delivering 49.3 or 54.7 horsepower, respectively. With enhanced environmental performance that meets Tier 4 Final emissions standards and increased Kubota diesel engine power, a new bold design and wide deck for ample leg room, the new MX-Series combines several upgrades with many of the well-received features inherited from previous MX-Series models. 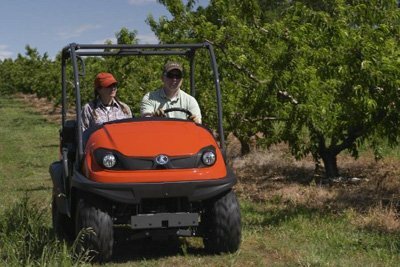 The new MX-Series delivers greater power and performance in an economical and versatile mid-size utility tractor.